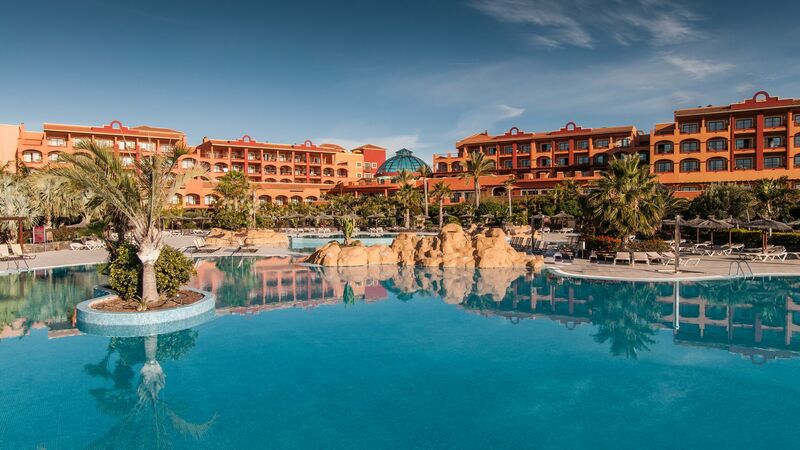 The luxurious Sheraton Fuerteventura Beach, Golf & Spa Resort is beautifully situated just moments from the golden sands and gentle blue waves. 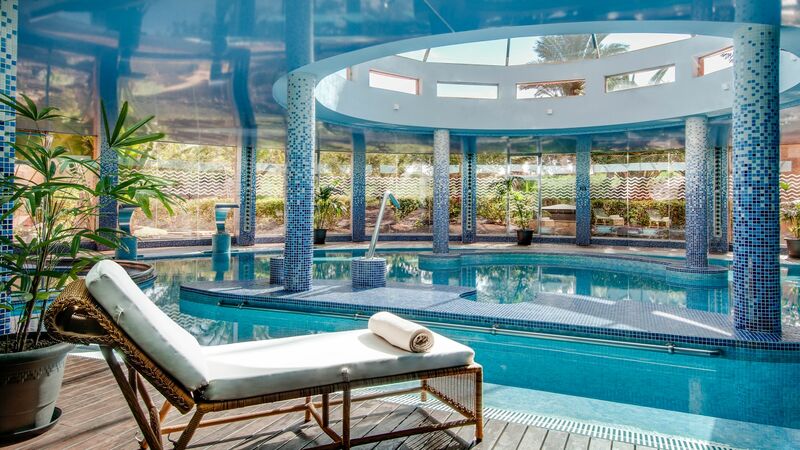 Combining modern style and a Canarian design with traditional Spanish influences, guests can relax after a round of golf at one of the two courses located next to the hotel, with a swim in either of the glorious pools, or a massage in the Hesperides Thalasso Spa. The resort welcomes families with open arms. 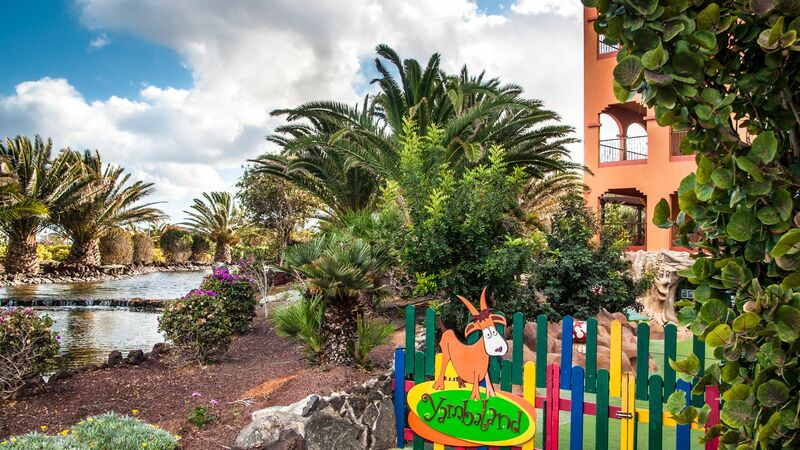 Yambaland Kid's Club caters for children aged 4-12 years and children's food is available in Los Arcos buffet restaurant (during peak season) and at La Veranda Mediterranean restaurant. Premium Deluxe rooms are ideal for families, with a balcony or large terrace that opens out onto the gardens. Specially modified rooms for people with limited mobility are available on request. The hotel has 266 rooms. Hotel child prices apply to ages 2–12 years. Los Arcos is the hotel's buffet restaurant and serves a range of national and international dishes. The restaurant also has its own cellar so guests can chose from a selection of wine to accompany their meal. This restaurant also offers a selection of dishes specifically for children during peak season. El Faro de Antigua is a traditional Spanish restaurant offering a selection of national dishes within a relaxed and refined atmosphere. 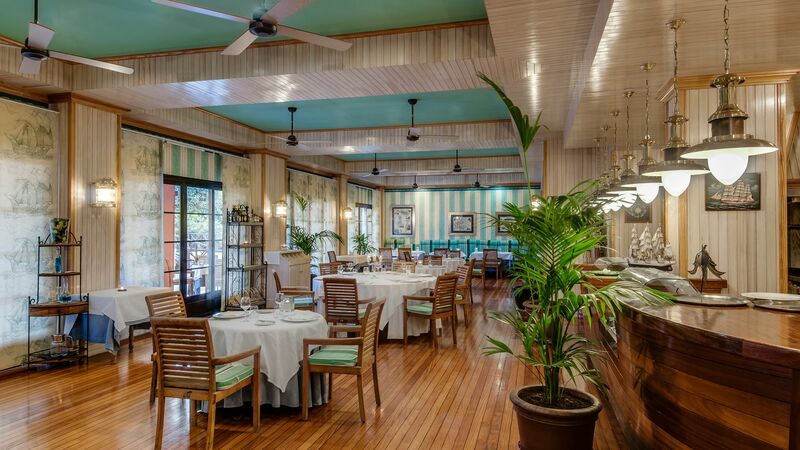 La Veranda is located overlooking the swimming pool and close to the beach. 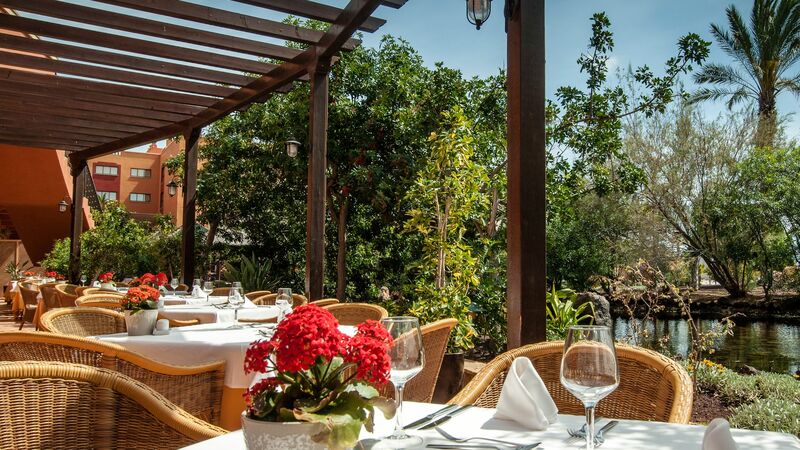 The restaurant offers a range of Mediterranean dishes in a relaxed and informal setting. They also have a selection of dishes which cater specifically for children. Wok-N-Zen Asian Restaurant serves an array of dishes from all over Asia including Thailand, Malaysia, China and Japan. 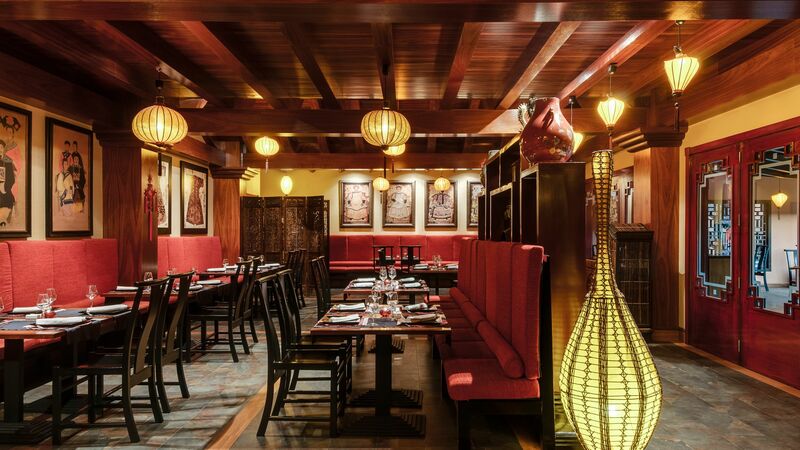 Designed to reflect the style of an oriental garden, this restaurant is perfect for those looking for a sophisticated dining experience in modern, tranquil surroundings. 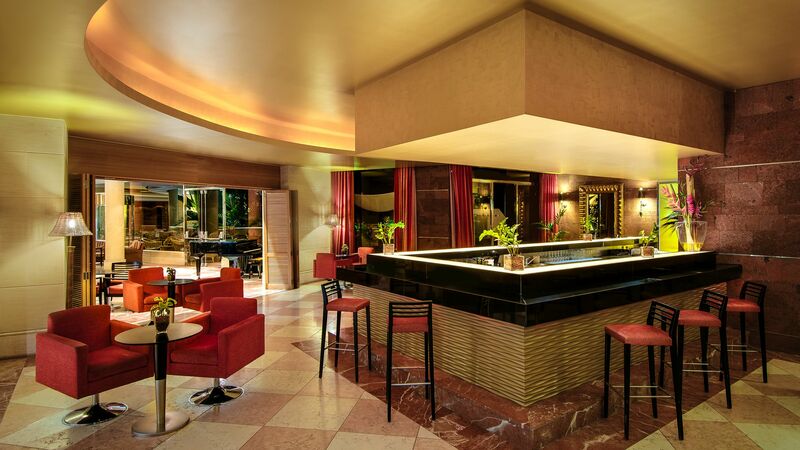 The Piano Lobby Bar is the perfect place to enjoy a relaxing coffee in the afternoon or a pre-dinner cocktail. The bar hosts live music several times a week. The hotel offers a choice of three swimming pools including a heated pool for children, all set amid vibrant gardens and only moments from the beach. The hotel enjoys an enviable location right on the beachfront. The beach is a sandy affair, complete with loungers for rent and a range of local amenities nearby. Yambaland Kid's Club offers an extensive daily programme including entertainment and activities organised by the animation team as well as having a soft play area and open-air garden with playground. Yambaland caters for children between 4-12 years. The Hesperides Thalasso Spa offers a range of body, beauty and relaxtion treatments using 100% natural skincare products. As well as the hydrotherapy pool, guests can choose from a selection of massages, body wraps, facial treatments or take advantage of the steam room. Children under 17 are permitted in the spa between 09:30 - 14:30 when accompanied by an adult. At all other times, children under 17 are not permitted. Sheraton Fuerteventura Beach Golf and Spa Resort is located on the east coast of Fuerteventura, close to Caleta de Fuste. It’s close to the golden sands which curve around the beautiful bay of Caleta de Fuste beach, making it ideal for those who want to spend their holiday relaxing. Golf lovers will find two professional standard courses within five minutes’ drive of the hotel. Golf Club Fuerteventura is a challenging course with striking views, while Golf Club Salinas de Antigua hosts tournaments and offers excellent cuisine. Culture lovers can explore the ancient castle, Castillo de San Buenaventura, in Caleta de Fuste, while children will love the boat trips available. Those wanting to explore underwater will find scuba diving and snorkelling available as well. 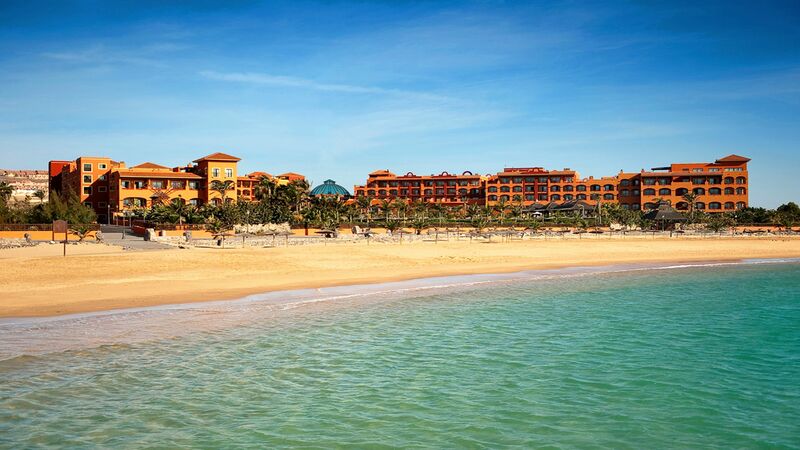 Sheraton Fuerteventura Beach Golf and Spa Resort is a 15 minute drive from Fuerteventura Airport. The Premium Garden View rooms are located on the lower floors including the ground floor and comprise a king-size bed or twin beds. They have views of the subtropical gardens and benefit from their own terrace area. The Deluxe Rooms have fantastic views of the Atlantic Ocean and feature a king-size bed or twin beds. The Deluxe Rooms have fantastic views of the Atlantic Ocean and feature a king-size bed. The Family Premium Rooms overlook the tropical gardens and are suitable for two adults and two children. Rooms have a sitting area and bathroom with bathtub and shower. Rooms are equipped with a minibar, airconditioning, Wi-Fi, safe, hairdryer and telephone. These spacious rooms feature a king-size bed or twin beds as well as a seating area. Outside there is a terrace area which benefits from lovely views of the gardens and has wicker sunbeds. The bathroom features a Jacuzzi® bathtub. These large rooms have the additional benefit of views of the Atlantic Ocean and the bathroom features a Jacuzzi® bathtub. The Family Prestige rooms comprise of two deluxe sea view rooms interconnected to make the perfect space for larger families. The Executive Suites provide a luxurious alternative for those looking for more space as they have a cosy lounge in addition to the bedroom. The rooms also benefit from fantastic sea views. The Presidential Suite is the perfect choice for those looking for a luxurious treat. Located on the top floor of the hotel and comprising two bedrooms, two bathrooms and a spacious lounge area, the suite also boasts the best sea views that the hotel has to offer. Save up to 25% discount on hotel price for holidays between 01 May - 31 October 2019 booked by 30 April 2019. The first child stays free when sharing a room with two adults for holidays between 08 July - 27 August 2019 & 14 - 31 October 2019 booked by 30 April 2019. Guests receive complimentary upgrade to Half Board for holidays until 31 October 2019 when staying in a Junior Suite Premium Garden View. Sovereign guests will receive one complimentary entrance to the spa from the age of 17 years for holidays until 31 October 2019. Guests staying for more than 7 nights on half or full board basis will receive one a la carte dinner per person per stay (drinks not included) for holidays until 31 October 2019. Guests (17yrs+) will receive one complimentary entry to the spa for holidays between 13 January - 13 February 2019 & 02 - 16 March 2019 & 01 - 31 May 2019 when staying in a Junior Suite Premium Garden View, Junior Suite Sea View, Executive Suite Sea View or a Presidential Suite Two Bedroom Sea View. Special prices available when one adult is travelling with children - please call one of our trusted advisers for details. Honeymooners receive sparkling wine and a fruit basket on arrival, one free entry to the spa and a complimentary room upgrade subject to availability on arrival. We stayed here for 8 nights at the end of February. On arrival, we were upgraded to a suite as a perk of being a platinum member. The check in process was enjoyable as we sat comfortably sipping a drink whilst we were checked in. Our room had a large bedroom with a separate lounge. The bathroom had a large jacuzzi bathroom which was great. The hotel has large and beautiful grounds with large swimming pools and gardens. The hotel is next to a public beach but we did not use the beach. On arrival, we were offered a half board food package and we were glad we did not take up this option. The food in the restaurants, the main restaurant and the a la Carter restaurants is very poor. However the breakfast in the main restaurant was very good with a lot of choice of buffet food. The hotel is within an easy walking distance of the main town which has a lot of choice of restaurants and bars. The hotel is also next to a (average) golf course, although you need a taxi ride to get to the club house. 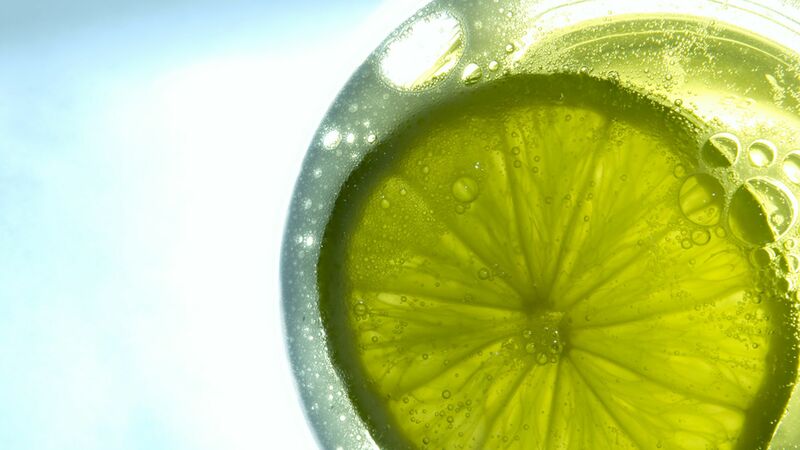 The hotel does not provide discount on food and drinks to Marriott Members. I do not understand why this hotel has decided to go against the Marriott policy or perhaps the management simply haven?? ?t understood Marriott policy. Although the hotel needs some refurbishment in places, it is still a good resort worth a visit. The weather was a bit hit and miss, but it?? ?s April, and you can?? ?t blame the hotel for that. The welcome, service and staff at the hotel are just fabulous. They made our stay so enjoyable as they are welcoming, helpful and go way further and beyond what you would expect. The food at the buffet was amazing! Different every meal, so much variety and even oysters, prawns and sushi came out. The waiters were excellent, efficient and wonderful. We made friends with the hotel cat ???Manolo??? who appears at every meal. The pool water was warm, the spa fabulous and the beach right outside super clean and really nice. It?? ?s a bit of a walk to the local village and there are probably more exciting places to go with teenagers, but if you have small kid....there is loads of entertainment for them and it?? ?s just ideal. We will definitely come back. The place was fine. To start with check in, had to offload my own luggage from the cab (never happened to me in a 5 star). That followed with 15 to 20 mins wait at check in. Rooms were ok, except for the ac not very effective and the fan very noisy. Breakfast was the best thing in the hotel although most of the days had to get my own cappuccino with 10 mins wait in a queue. Avoid half board as not worth it as dinner was pretty bad most days. Bell boys were very good but the front desk staff not good and not attentive to details. We had 2 kids and had no clue of the kids activities everyday (got to know last day by chance). Room amenities were ok, nothing great. Won?? ?t be visiting these guys paying a 5 star price for a 3 star service!